TomCat: Let me try a shot in the dark here. Assumption 1: You play with sound. Assumption 2: Your Laptop has some kind of HDD damage protection thingy. Assumption 3: This protection thingy is correlated with the Health Monitor. Regrettably, I play via Headphone setup or piped through a standalone tuner and speakers. I don't use the laptop speakers when at home. I believe Zorg means no sound as in game sound disabled. With speakers on or not. Jonny, I meant the laptop speakers (or any other speakers which could activate a shake sensor accidentally). I can't imagine this happens via headphone. Sorry it didn't help, TomCat. Hope you'll find a solution. @Zorg - Thanks Zorg, I read your whole post so knew exactly what you were talking about. I've activated that HD vibration sensor a few times so am intimately familiar with it. @Eirhule - Interestingly enough, with the July 23, 2010 package I just had a win32 exception error. I have a jpg snippet of it but am not sure where to post it so you can get your debug info. I was playing Insta CTF for about 4 or 5 maps when it occurred. Please let me know where I can send the jpg snippet. Much easier and faster than me trying to transcribe all the text to here (no cut and paste from images). *Eihrule - Sorry for the typo in your name. Well..... I really don't want to stop playing Sauerbraten. This is starting to get to me. Played a bit of regen and disconnected after a bit, 2 partial maps rounds. Came in on one, left before second was over. Started playing some Insta CTF being I'd never hit a problem (except the exception just a bit before with water and sdl I think) and not even 5 minutes into the round of insta ctf, reboot. Yet I can play Oblivion for an hour solid and that is a WAY more intensive engine last I knew. And it plays Oblivion on much higher settings and smoother than my old 7800 GS CS AMD XP 2800+ machine ever did. Yet that old machine never had problems With Cube 2 while this machine does. Is there a way to have Sauer log everything during play? Maybe then we might see what it's chocking on or at? Speedfan reports all tempuratures to be within spec. Hmm, try disabling soft shadows (choosing for blob shadows instead) in the gfx tab. I know that they're giving me some problem with screen tearing and unstability on my FireGL V5250 card; they might give you problems, too. @Megagun - I'll give that a shot. Thanks for the suggestion. Here's a quick list of non-praise (because everyone knows that the new defaults for /newmap are awesome, and that f9 in editmode is epic win, right!?) comments I have regarding the current release. These are mostly related to new features, plus things that have been bugging me a lot. These are sorted (as far as I can tell) by easiest-to-implement first. [FIX] Hitting F2 in editmode to go to the texture browser, and then hitting escape opens the main menu, rather than closing the texture browser as is expected. All other menus (like F3/F4 in editmode) *do* close when hitting escape. [IMPROVEMENT] `/bind a` should echo the command bound to a (echo (getbind a)), and `/bind a ""' should clear it, just like in the Source engine. Currently, `/bind a` clears the bind. [ADDITION] `clearlightmap` command to clear the lightmap. Currently, there doesn't seem to be a way to completely clear the lightmap neatly (I think you'd have to write a script to copy all lights, remove all lights, recalc lightmap, then paste them again). [FIX/IMPROVEMENT] Two texture rotation configurations are missing in `texrotate` and `vrotate`: "90 degrees rotation + x flip" and "90 degrees rotation + y flip". [ADDITION] `copytexplusparams` (or something) command to copy the selected texture plus it's parameters (vrotate, voffset, vsize, etc). Also, a `pastetexplusparams` command to paste the copied texture. [ADDITION] `allvfaces` command that mimics the `allfaces` command. "allvfaces 1" should make it so that any vcommand (vrotate, voffset, vscale) should be applied to *all* faces. [ADDITION/IMPROVEMENT] Shift+clicking on a texture in the texture browser should be a short way to use the "vlayer N" command, so that you can easilly set the texture to paint in blendmode with without having to guess what number it is, or using F9 to figure that out. [ADDITION] Ability to spawn bots (like in Bot-DM) in SP mode with an optional parameter to set the model directory. Alternatively, a "setmonster N *" command to set monster N's weapon type, model directory, etc. [IMPROVEMENT] Textures with an alpha channel should be blended with nicely, so that you can create blood splatters on the wall nicely (http://www.rockpapershotgun.com/images/april08/sshock2d.jpg). Unfortunately, this would probably require horizontal painting of blendmaps which you're currently not able to do. Pending a real response from eihrul, try turning off water reflections. It looks like that's where it's crashing. 9) to have any alpha blending, you first need to add alpha material. you can then use /valpha 1 to make the surface completely opaque while keeping alpha blending active. Also to do that ideally, you'd need to use a texture with the writing already there. This also means using a mapmodel would be a significantly better choice. I'm happy to annouce that with Soft Shadows turned off (Blob Shadows enabled) and turning off water reflections, that I was able to play for over an hour without issue. I will keep play testing but I think that the soft shadows is probably the major factor, thank you for that suggestion Megagun. It's strange that a DirectX 10.1 GPU would have problem with soft shadows but alas... So does the fireGL though so maybe something is slightly askew there... I dunno, I'm rather happy that I can play consistently again, or so I think :) Time will tell. The OpenGL drivers on your hardware could just be randomly/catastrophically buggy, which is par for the course with ATI + OpenGL. 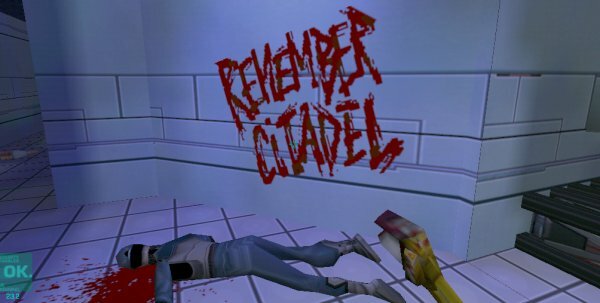 ...and remember to "setshader decalworld". And TomCat39: that error dialog is unusually descriptive, and it apparently indicates exactly where the game crashed and where it came from. You can probably safely turn soft shadows back on, as it seems something in water reflections is the culprit. Actually it's Windows 7 home premium 64 bit and NVidia GT 230M GPU with the latest NVidia notebook drivers 197.16. I purposely avoided ATI because of past issues with games and Radeon gpu's. So that may explain the FireGL having issues (ATI based card). However it's also not playing nicely with a middle class NVidia GPU also. I actually went the other way. I turned Water Reflections back on but left soft shadows off. The Win32 exception is quite rare to pop up. The random no event logged reboots were not. So far, I've not had reboots with Soft Shadows off, and reflections on. A Sauer Crash once in a great while is not very bothersome for me being I can just reopen Sauer. Reboots however take quite a significant amount of time to get back in game. 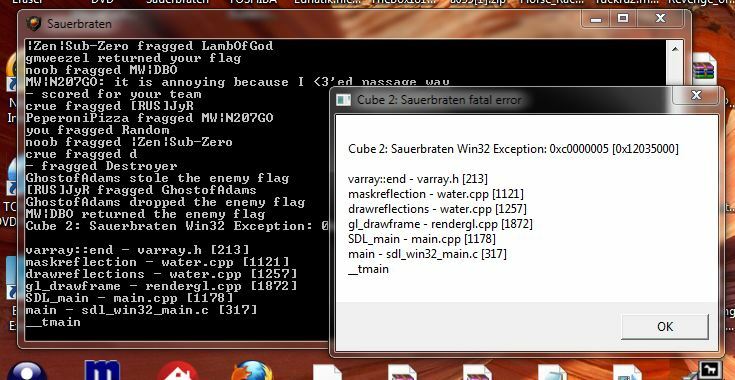 I've only seen an Win32 exception happen maybe three times in over a year of play. I thought I'd share it with you all as an FYI. Random eventless reboots,on the other hand, drive me nuts being this Win 7 laptop with a 5400 rpm harddrive takes a solid 5 minutes or more to fully boot up and load everything into memory. Linux does have it's advantages.... But alas, I'm not Unix savvy. I'm still running the test of time, but I'm confident the Soft Shadows is what had been causing my undecipherable reboots. I installed the July 28th version today and started playing a touch. Soft Shadows off (Blob Shadows enabled). Playing Insta Hold, I minimized to look at the command window of Sauer (I did use the scroll bar in the window to scroll back some for a moment), when I went back into the full screen game window (not windowed mode) I was totally lagged from server. It wouldn't disconnect or resync. I had to red ex (windows 7) and close Sauer. I then restarted the Sauer exe and went back to the server. About 20-30 seconds in, it rebooted my computer. After windows fully loaded up, I went back to the July 23, 2010 package and played for an hour with no issues (with blob shadows enabled/soft shadows disabled). I also didn't minimize. I could test this to see if I can repeat it with the 23rd package if you wish. Seems like the July 28, 2010 package did not like being minimized for very long on windows, or doesn't like you scrolling back in the command window to read text. At least not in Windows 7 64 bit.